Recent outbreaks of bluetongue virus (BTV) serotypes 2 and 8 in many European countries provided an opportunity to investigate the possibility of improving the safety of the modified live vaccines administered mainly in South Africa. Modified live vaccines (MLV) released at a titre of 5 x 104 PFU/mL, raised concerns and prompted the need to determine the minimum titre which will still be protective and also safe. The BTV serotypes 2 and 8 vaccines were produced at the following titres: 102 PFU/mL, 103 PFU/mL and 104 PFU/mL, and were injected into 24 sheep which were then monitored. Blood was collected on days 0, 3, 6, 9, 12, 15, 18, 21, 25, 28 and 4 months post vaccination, for seroconversion and viraemia studies. These sheep were later challenged at 4 months post vaccination using BTV infected cell culture material, they were then observed and bled and again tested for viraemia. There was no viraemia post vaccination, however, a febrile reaction did occur and seroconversion was demonstrated at low titres for both BTV 2 and 8. 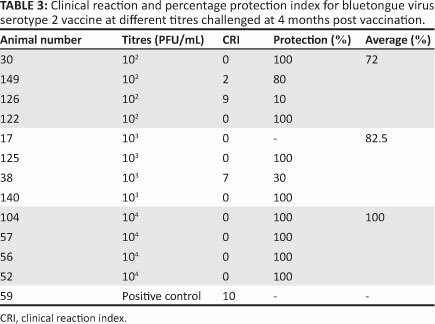 Although viraemia was demonstrated post challenge, sheep vaccinated with the low titre BTV 2 vaccine showed more than a 90% protection index at a lower titre of 103 PFU/mL, compared with BTV 8 that showed a protection index above 90% at all the titres used. It is recommended that for BTV 2 vaccine, sheep should be vaccinated at a titre of 103 PFU/mL and at a titre of 102 PFU/mL with BTV 8 vaccine. Bluetongue virus can infect a wide host range, and because of this the different BTV serotypes and the role played by Culicoides spp. as vector, the eradication of this disease in endemic areas such as in SA would be difficult to achieve.6 In countries endemically infected with BTV, vaccination has proved the most effective and practical method implemented to reduce the spread of this disease.5,6,7,10 The economic impact of using other methods of control, such as slaughter, has led most countries to consider vaccination as the best tool available to control the spread of the disease. Different types of vaccines have been developed to prevent BTV infection of ruminants. These include: modified live vaccines (MLV), inactivated whole (killed) virus preparations11,12 and virus like particles (VLPs). The latter allows the co-expression of three, four or five BTV genes from a single recombinant vector like the baculovirus multigene expression vector system. Other vector systems include vaccinia-, capripox- or canarypox viruses.13,14,15 Only MLV and inactivated vaccines are commercially available and have been administered in recent years. Millions of doses of MLV are issued annually in South Africa to vaccinate sheep. Since 2000 Onderstepoort Biological Products (OBP) has also sold several million doses of monovalent BTV vaccines to different European countries.25-26,27 Currently all the serotypes in the cell culture adapted vaccine are released at a titre of 5 x 104 PFU/mL. However, concerns were regularly raised about the long duration of viraemia that may sometimes occur after vaccination, especially in merino sheep.28,29 This prompted the need to investigate the possibility of producing low titre BTV 2 and 8 vaccines which would still be protective, more economical and without severe side effects. The experiment was conducted at OBP Ltd in SA (25°29'S, 28°.11 E, 1219 m a.s.1.). A total of 28 merino sheep that tested negative for antibodies to BTV (Indirect ELISA, Agriculture Research Council, Onderstepoort Research Institute [ARC-OVI]) were selected and ranged in age from 9-12 months. The sheep were kept in an insect free isolation stable, were fed daily according to a random schedule and had continuous access to clean water. Vaccines for BTV serotypes 2 and 8 were developed from field isolates obtained in SA and isolated at the ARC-OVI. Production of the vaccines was implemented according to the current Standard Operating Procedure (SOP) of OBP (proprietary information). Prior to production, the identity of the working seed virus was firstly confirmed at the Biochemistry Section of the ARC-OVI using the SNT and a reverse transcriptase polymerase chain reaction (RT-PCR). Viruses were grown on baby hamster kidney cells and titres post freeze drying were 1.17 x105 PFU/mL for BTV 2 and 1.17 x 106 PFU/mL for BTV 8. Prior to injecting sheep, the freeze dried material was reconstituted with sterile water and diluted further to obtain 102 PFU/mL, 103 PFU/mL and 104 PFU/mL titres for both serotypes. Vaccines were injected into 12 sheep per serotype and subdivided to 4 sheep per titre. A total of 24 sheep were vaccinated using 1 mL of vaccine and injected subcutaneously on the inner side of the thigh. A positive control, which was not vaccinated but was challenged and a negative control, which was not vaccinated and not challenged for each BTV serotype, was included. The sheep were clinically monitored post vaccination, and temperature readings were recorded for 14 days. The sheep were post bled using 10 mL vacutubes containing lithium heparin as an anticoagulant and 10 mL vacu-tube for serum, without an anticoagulant. Blood was collected on days 0, 3, 6, 9, 12, 15, 18, 21, 25 and 4 weeks and also 4 months post vaccination. Heparin blood was tested for viraemia and the serum for neutralising antibodies indicating seroconversion. Four months post vaccination, both heparin blood and serum were collected from the controls and vaccinated sheep, and, following this, the sheep were challenged (except the negative control sheep) with the homologous BTV serotype. They were then clinically monitored, temperature reactions were recorded for 14 days post challenge and were scored using the method of Huismans, Van der Walt, Cloete and Erasmus (1987).30 Blood was collected in heparin tubes on days 0, 3, 6, 9, 12, 15, 18, 21, 25 and 28 post challenge. The bluetongue virus serotype 2 challenge material was obtained from the ARC-OVI collection whilst serotype 8 was an isolate, BTV 8(G) 5/10A 2006/01KC 3BHK, that was obtained from the Institute for Animal Health (IAH) Pirbright, UK. The challenge material was prepared from cell cultures in which Vero cells were infected with infected sheep blood, observed for cytopathic effect (CPE) and the titre determined by viral plague assay and adjusted to a titre of 1 x 106 PFU/mL. Every 3rd day post vaccination and post challenge, 5 mL - 10 mL heparin blood was collected for virus isolation. The method applied was according to the SOP of OBP, as described in the OIE Terrestrial Manual 200831 and also as described by Clavijo, Hecket, Dulac and Afshar (2000).32 Blood was considered negative for viraemia when no CPE was evident, even after the blind passage of the supernatant. Samples that showed CPE were further titrated on confluent Vero cells in 6-well plates to confirm results. Vaccinated sheep showed a rise in temperature but no clinical disease. Some of the challenged sheep showed a rise in temperature but no clinical disease. One of the positive control sheep (challenged but not vaccinated) died 8 dpi. Sheep vaccinated with the BTV 2 vaccine titre of 102 PFU/mL had pyrexia from day 7 to 9. All sheep vaccinated with BTV 2 vaccine titre of 103 PFU/mL had pyrexia from day 5 to 7 and also on days 11 to 13. Two sheep had high temperature reactions of 41 °C and 40.7 °C, respectively. Three sheep vaccinated with the high titre BTV 2 vaccine (104 PFU/mL) had pyrexia from day 6 to 8 on different days. All sheep vaccinated with the low titre BTV 8 (102 PFU/mL) vaccine had pyrexia on different days (5, 7 and 8). Additionally, those vaccinated with 103 PFU/mL had pyrexia on different days from day 5 to 8, however, one sheep reacted only on day 6. The same reaction was seen in sheep vaccinated with high titre vaccine pyrexia, on days 6, 7 and 9. The temperature of the negative control was normal. No viraemia was detected in any of the sheep post vaccination. Three sheep vaccinated with the BTV 2 vaccine titre of 102 PFU/mL, and challenged with the BTV 2 cell culture material, had pyrexia from day 1 and again on day 3 to 4 post challenge. Only one sheep, vaccinated with BTV 2 vaccine (103 PFU/mL), had pyrexia from day 2 to 6 post challenge. There was no pyrexia post challenge in sheep vaccinated with the high titer vaccine (104 PFU/mL), except the positive control sheep which had pyrexia from day 3 to 5 before it died on day 8. Two sheep vaccinated with low titre BTV 8 vaccines (102 PFU/mL and 102 PFU/mL) had pyrexia on day 1 and 4 after challenge. The sheep vaccinated with the high titre vaccine (104 PFU/mL) did not demonstrate any abnormal reactions, except the positive control sheep that had pyrexia from day 66-10. Viraemia was detected in two sheep post challenge, at 4 months post vaccination with both low titre BTV 2 vaccines (102 PFU/mL and 103 PFU/mL). Only one sheep showed viraemia, of those vaccinated with the high titre vaccine (104 PFU/mL). Viraemia was not detected in sheep challenged with BTV 8 in all three vaccinated groups. The sheep vaccinated with the low titre vaccine (102 PFU/mL and 103 PFU/mL) were seropositive on ELISA by day 21 post vaccination, and showed varied neutralisation titres of 1:16 to 1:64 within 4 weeks post vaccination. Similar titres were observed at 4 months post vaccination. Those vaccinated with high titre vaccine also had neutralising titres within 4 weeks and also 4 months post vaccination (Table 1). Two sheep seroconverted on day 9 post vaccination, whilst one sheep did not demonstrate detectable antibodies, even 4 weeks post vaccination. However, all sheep had neutralising antibody titres above 1:16 at 4 months post vaccination (Table 2). At four months post challenge the sheep vaccinated with the low titre vaccine (102 PFU/mL) had 72% protection and two sheep had very high clinical reaction indexes. The positive control sheep had a high CRI and died on day 8 post challenge (Table 3). The presence of BTV 2 was confirmed by viral isolation. 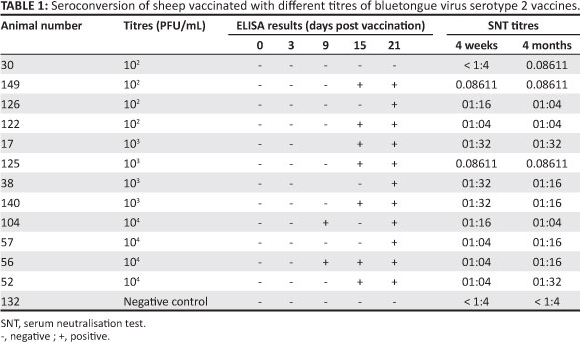 All sheep vaccinated with low titre vaccine (102 PFU/mL and 103 PFU/mL), and challenged with BTV 8, showed protection of 100% and 90.75%, respectively. The sheep vaccinated with the high titre vaccine had a 100% protection level (Table 4). The relevant controls were used during the vaccination and challenge of the sheep as well as in all laboratory tests performed. Validated standard operating procedures were followed in the laboratory. Results obtained are trustworthy. 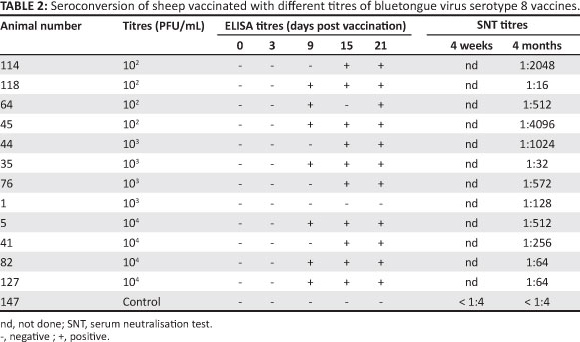 In BT endemic areas, such as SA, the BTV MLV is predominantly applied to control BT disease in sheep,8,10 and this vaccine has successfully played a major role in controlling the spread of the virus in Europe.5,10,25 Virus titres induced by BTV MLV should be kept to an absolute minimum especially if transmission by vectors of viruses, included in the vaccine, is a concern.8 This is because the complex interaction of the different serotypes of BTV, Culicoides vectors and animal hosts in the life cycle of the virus. The existence of at least 22 serotypes of BTV's in SA and the presence of vectors that can transmit the disease, to different susceptible hosts, make the administration of BTV MLV economical for sheep farmers. However, the European Union has decided not to administer BTV MLV on the grounds of various concerns. These include the possible reassortment of vaccine viruses with circulating field strains and the possible reversion to virulence,34,35,36 the transmission of these viruses by vectors and the lack of a DIVA test for these vaccines .3,27 Another concern is the presence of a long duration viraemia when BTV MLV, with titres of or above 104 PFU/mL, are administered. It is also at this titre that susceptible sheep show clinical signs and suffer abortions.6,22 The administration of BTV MLV in Europe has, therefore, created concern and the need has arisen to investigate the use of reduced titres of 102 PFU/mL and 103 PFU/mL in the vaccine for administration in sheep. Cell culture material, and not blood, was selected as challenge material. From previous experience it was noted that the reaction to this in sheep is either late or poor when blood was used, as compared with cell culture material.8,38 The reason for this might be that BTV is a cell-associated virus and binds mainly to red blood cells, platelets and mononuclear cells.29,39,40 It is, however, important to realise that cell culture generated material might lead to the attenuation of the virus, which includes changes in virulence and antigenicity.8,36 Blood-cultured material should, therefore, rather be applied as challenge material. Three sheep vaccinated with low titre 102 PFU/mL BTV 2 had higher temperature reactions, above 40.5 °C - 41.5 °C, within the first 14 days post challenge, for 3Â4 days. The same result was also seen in sheep vaccinated with low titre BTV 8 vaccine. Although the BTV 2 low titre vaccine (102 PFU/mL) gave a protection index lower than 90%, the vaccine was able to protect the sheep from this clinical disease, especially when it is noted that the positive control sheep died. This confirms what was previously described, that BTV MLV offers 90.5% protection against clinical disease.10,18,20,25 There was also a good correlation between seroconversion and the protection index of sheep vaccinated with BTV 8 vaccines. The protection index of sheep vaccinated with BTV 8 was above 90% at all titres. It should also be noted that the positive control of sheep challenged with BTV 2 had a far higher CRI (10) compared with the vaccinated group. The results also confirm that BTV 2 challenge material was more pathogenic than BTV 8 challenge material if comparison is made of the two viruses (Tables 3 and Table 4). It was clearly shown in this study that sheep vaccinated with the BTV 2 and 8 vaccines reacted differently. This confirms the results obtained by Howell (1969),18 that each BTV serotype reacts differently and their immunogenic potential differs from serotype to serotype. Although at a low titre (102 PFU/mL) BTV 2 vaccine offers protection against severe clinical disease, it is recommended to release the vaccine at a titre of 103 PFU/mL. The bluetongue virus serotype 8 can, however, be administered at the low titre of 102 PFU/mL. This study confirms that low titre BTV 2 and 8 vaccines are both immunogenic, and it is recommended that during production and release of multi serotype BTV vaccines, specific serotype titres should be considered rather than the average of all titres in a batch, as is currently practiced. More work remains to be undertaken to quantify the duration and level of viraemia post vaccination and post challenge, especially when low titres of virus are administered. Low titre vaccines should also be tested when included in a polyvalent format, as opposed to monovalent vaccines, as was done in this study. The response of indigenous European sheep breeds, different from those in SA, to low titre BTV vaccines should be assessed. To evaluate this, other diagnostic tools, like PCR, should also be used. It will additionally be important to investigate and assess the cost benefit of using both polyvalent and movalent low titre modified live attenuated BTV vaccines, and compare the risk factors associated with their use in sheep. Although viraemia was demonstrated post challenge, sheep vaccinated with the low titre BTV 2 vaccine showed more than a 90% protection index at a lower titre of 103 PFU/mL, compared with BTV 8 that showed a protection index above 90% at all the titres used. It is therefore recommended that for BTV 2 vaccine, sheep should be vaccinated at a titre of 103 PFU/mL and at a titre of 102 PFU/mL with BTV 8 vaccine. Financial support as well as the preparation of the vaccines were undertaken by Onderstepoort Biological Products. No competing interests that the authors are aware of. The research was done as part of a masters dissertation by J.M. (Onderstepoort Biological Products). The practical work was done by J.M. (Onderstepoort Biological Products) and supervised by E.V. (University of Pretoria). E.V. (University of Pretoria) wrote and submitted the manuscript.